It’s impossible to spend much time with me before I start talking about the Chicks. Not the Dixie Chicks (watch out, Earl) but the Church Chicks. That’s how we started because most of us met in church. In 1996, I worked at the Home Mission Board (now known as the North American Mission Board or NAMB) of the Southern Baptist Convention. That’s where I met Sarah, who introduced me to Lisa. They invited me to visit their church and I did. That’s where we eventually met Beverly and Tiffany. Sarah also introduced us to Regina and Mary (now living in Michigan). I introduced the Chicks to my college roommate (we became roommates again years later), Megan. That makes eight Chicks. When we get together, we cackle a lot. And we like to eat. Because in the South, food and friendship go together like a knife and fork. We lead busy lives so a Chick road trip is a rare thing but when it comes up, I try to be a part of it. When we started planning an adventure to Cloudland Canyon State Park in Northwest Georgia over Martin Luther King Jr. weekend, the Chicks knew that they were in for their first experience in cemetery hopping. Thankfully, they were excited at the prospect and let me plan some excursions. Cemetery hopping by yourself is fun. But with three other people, it’s even better because, as my son wisely says, more eyes see more stuff. That means finding graves faster. It also means I get to introduce people to one of my hobbies while praying they don’t think I’m off my rocker. But the Chicks already know I’m quirky like that and accept it, and even encourage it. Hopping in a rural locale is appealing to me. 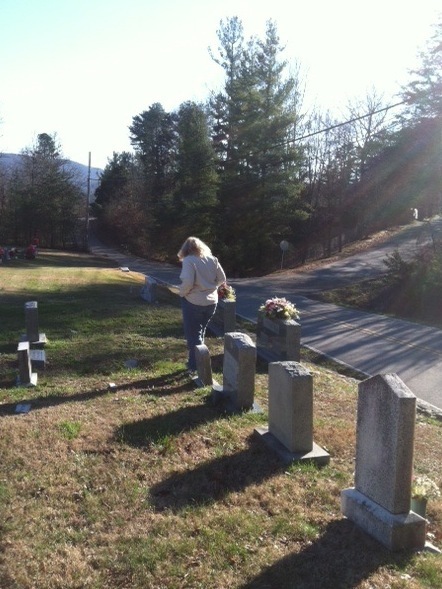 The cemeteries tend to be smaller and often include several generations of the same family. You can also see the same names popping up in different cemeteries. Then when you start seeing those names in the local roads, a history of the area starts taking shape. For example, at one point we were driving on Hinkle Road. 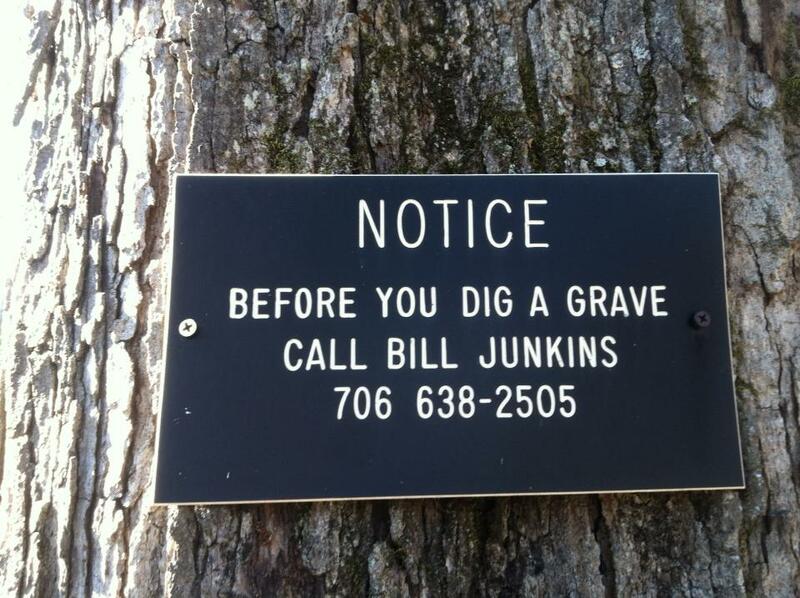 Sure enough, at one of the cemeteries we stopped at, there were Hinkles buried there. Our first hop was in Mount Pleasant Cemetery and from the beginning it was different. There was a tent up, indicating a funeral was happening soon. We saw two young men in uniform (I believe they were Marines) and something you don’t see in the middle of nowhere very often. A man dressed in a kilt practicing on the bagpipes. I hesitated to even stop, but since the three men were on the far side of the cemetery and casually talking, we decided to give it a try. I gave the Chicks some names and we started looking around. Beverly found one first and then I think Sarah was next. We didn’t find all of the graves we were looking for because some were really old and those tend to be impossible to read or are broken. When we saw the funeral procession coming down the road, we left as a show of respect to the deceased and the mourners. About five miles up the road was Paynes Chapel Cemetery, a picturesque and well maintained property. The graves were easy to find here, even the one hiding under the side of a bush. Megan hunts for a grave. On our way back to Atlanta, I found one last cemetery to stop at but this one was much harder to find. A bit off the beaten path. But those are some of the best cemeteries because they don’t get a lot of attention. Beverly’s GPS proved to be invaluable to us. 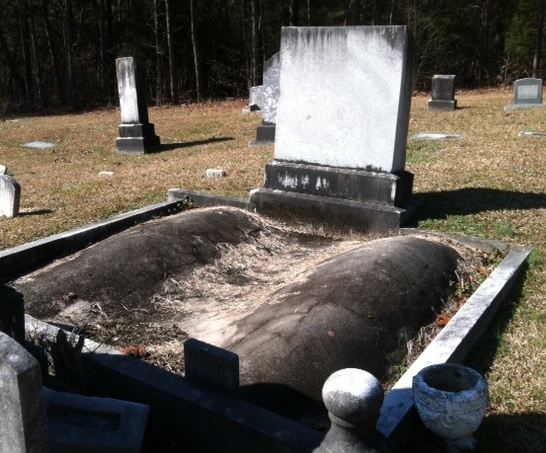 Wesley Chapel Methodist Cemetery is off Trion Highway (in case you wanted to know). The cemetery is on the hill behind the church and like many of the other country cemeteries I have seen, is well tended. But the first thing we noticed was this clever little sign. I’m tempted to call Bill since he sounds like a good person to know. Also unexpected were two dogs lounging at the edge of the cemetery. One was a tiny little thing but the other larger dog looked like a pit bull mix. When Beverly got to that side of the cemetery, she soon found out that the bigger dog wanted no part of us. We left him alone and he left us alone for the rest of our visit. I did not want my friends to end up hopping into a dog’s bared teeth. Now seasoned hoppers, we located the graves we were looking for pretty quickly. It’s always interesting to see the different styles of headstones and monuments. This one, for John Adam Wilson and his wife, Mary, looked a little different than the others. I’m at a loss as to why they were buried this way. It does not look like vaults were used. An amiable father here lies at rest/As ever God with His image blest/The friend of man/The friend of truth/The friend of age/The guide of youth. Benjamin Capus Wilson, according to Ancestry.com, was a farmer in Walker County who served in the 34th Georgia Infantry as a Confederate soldier. 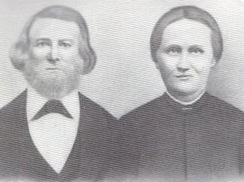 He and Elizabeth had nine children together. Most of them, like their son John, are buried closely around them. 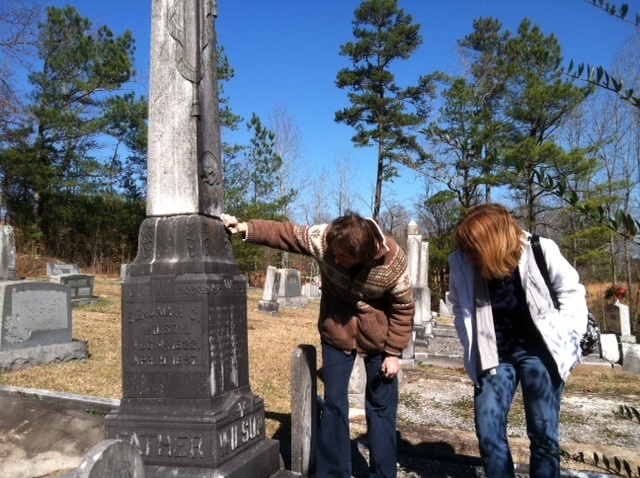 Sarah and Beverly take a look at the inscription on Benjamin Capus Wilson’s monument. On the drive home, I found myself wanting to come back to this neck of the woods again. Many of the graves I saw had been documented on FiAG but had no pictures to go with them. It looks like there aren’t a lot of FiAG volunteers in that area compared to Atlanta, where there are several of us to take on photo requests. Sound like a future Chick roadtrip, doesn’t it? 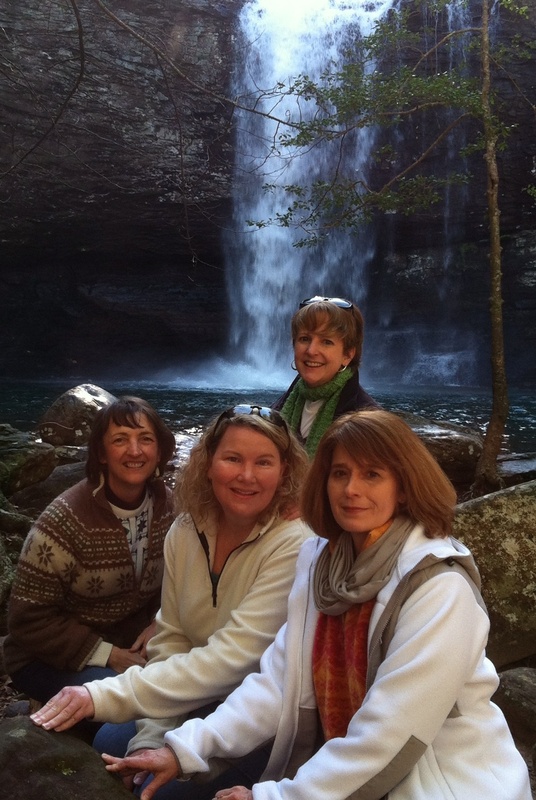 Sarah, Megan, Beverly and me after hiking to the bottom of Cloudland Canyon.